Applying liquid eyeliner requires patience and a steady hand, because a slip-up can spell disaster for your clothes. Liquid eyeliner contains several ingredients, including colorants, oils and fragrance, that are very difficult to remove from fabric. If the stain is relatively fresh, you may be able to erase most of it, or at least lessen its severity. Tackling an eyeliner-stained garment requires pretreatment, as well as cleaning in the washing machine. Spray the eyeliner stain with dry-cleaning solvent or dab it with a laundry stain remover. Allow the solvent or stain remover to soak into the stain for at least one minute. 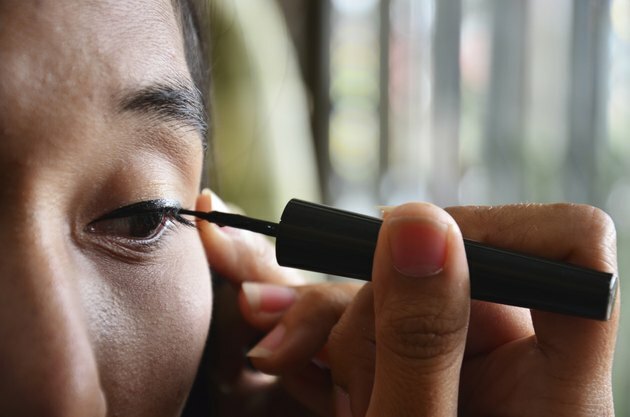 Rub the eyeliner stain with a small amount of heavy-duty liquid laundry detergent. Wash the garment as you normally would and check to see whether the stain has disappeared. Do not put the fabric in the dryer because the heat will set any remaining stain. If the eyeliner stain is still visible, dilute some all-fabric powdered bleach with water according to the instructions on the packaging. Soak the clothing in the bleach solution for 15 minutes. If all-fabric bleach doesn't work and the garment is white or color-safe, soak it in a diluted solution of water and liquid chlorine bleach. If the stain doesn't disappear after 15 minutes, stop bleaching. Continued bleaching will damage the fabric. Launder the clothing in the hottest possible water allowed for the garment. Some delicate fabrics, such as wool and silk, cannot tolerate harsh chemicals or heavy washing. Take these fabrics to a dry cleaner for treatment. Use caution when bleaching colored garments. Bleach can permanently discolor your clothing. Test bleach on an inconspicuous part of the garment before treating the entire piece of clothing.